Protesting Democratic City Central Committee not opposing segregation in St. Louis. St. Louis, Mo., Feb. 24, 1916. The Democratic City Central Committee has failed to take a stand against the measure to segregate negroes of this city to be voted on February 29th. The National Convention is to be held here in June. The inaction of the Central Committee may cause segregation. The National Committee should not be placed in an embarrassing position. Can you realize the importance of this inaction. 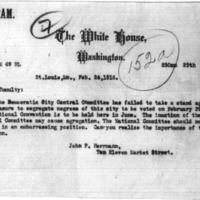 Herrmann, John P., “John P. Herrmann to Joseph P. Tumulty,” 1916 February 24, CS93, Race and Segregation Collection, Woodrow Wilson Presidential Library & Museum, Staunton, Virginia.